Cathy at Rambling In The Garden invites us to share an arrangement every Monday using materials collected from our gardens. Thunder and lightning was exciting briefly late Saturday night, but the activity brought very little rain. Zinnias began flowering ten days ago, cheering up the garden with colorful old-fashioned loveliness. By early June when daffodil foliage had finally died back so I could reclaim some space, I was losing interest in gardening because it was so extremely hot. But I found an old packet of Zinnia ‘Cut and Come Again’ (Zinnia elegant pumila), packaged for 2017 by Botanical Interests, and sprinkled out the seeds. Simple, colorful, heat-loving and reliable—what could be easier? In-between the time of planting seeds and harvesting the flowers, I celebrated a birthday with lots of family. The container today is one of a pair of mugs I received during a big family get-together that unexpectedly turned into a bit of a birthday fest for me. 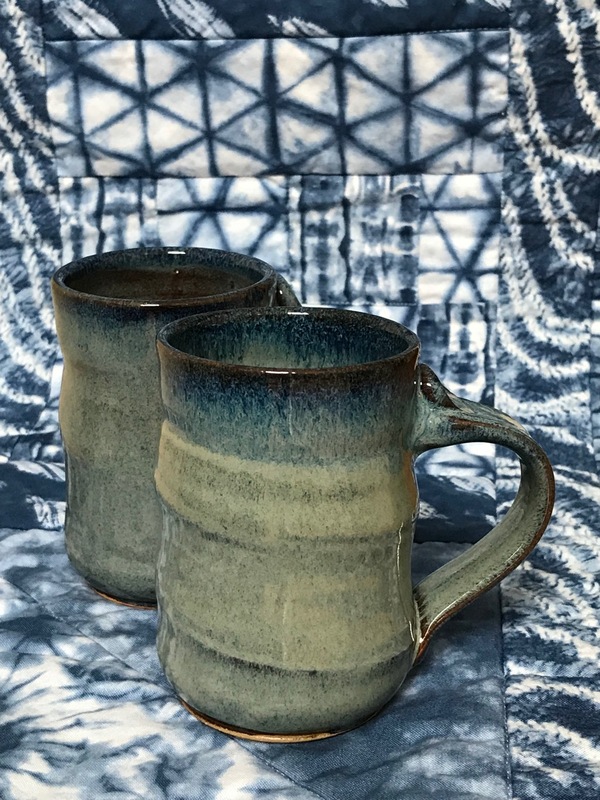 The cups were crafted by my niece’s mother-in-law, featuring beautiful form and blue glaze. 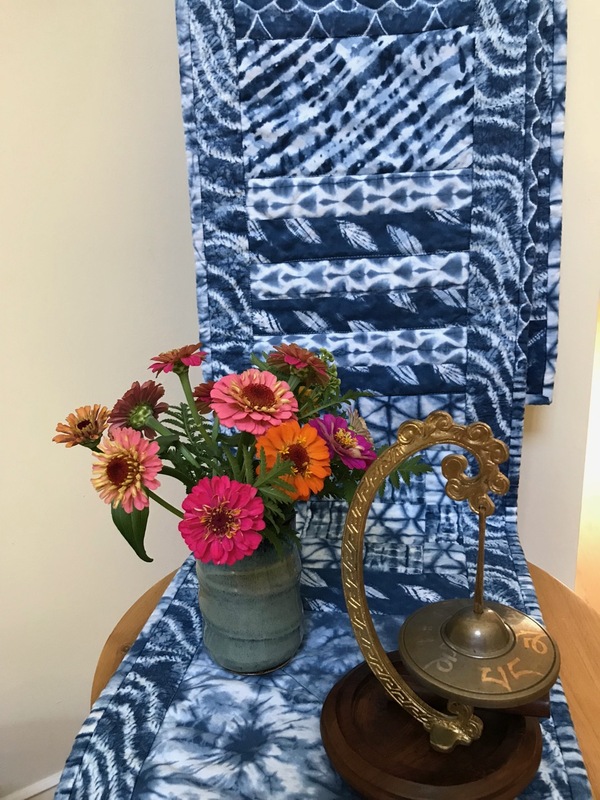 The blue batik table runner was made by my sister using special Japanese fabric. Light in the dining room was fading so for staging pictures I draped the table runner over a chair in the foyer. I decided to include another gift. This spring I began teaching yoga and meditation regularly so this Tibetan meditation chime from another sister was particularly thoughtful. Well back to this Monday’s design, a single stem of fern-like foliage of Tanacetum vulgare (Tansy) inserted into the mug created support structure that worked well to hold the zinnias in place. As well, there is a cluster of Tansy flowers just beginning to open. The flowers look sparser from the back but I love the color of this largest zinnia. Stoneware mug. Mary Murray, Mountain Forest Pottery, Brevard, NC. 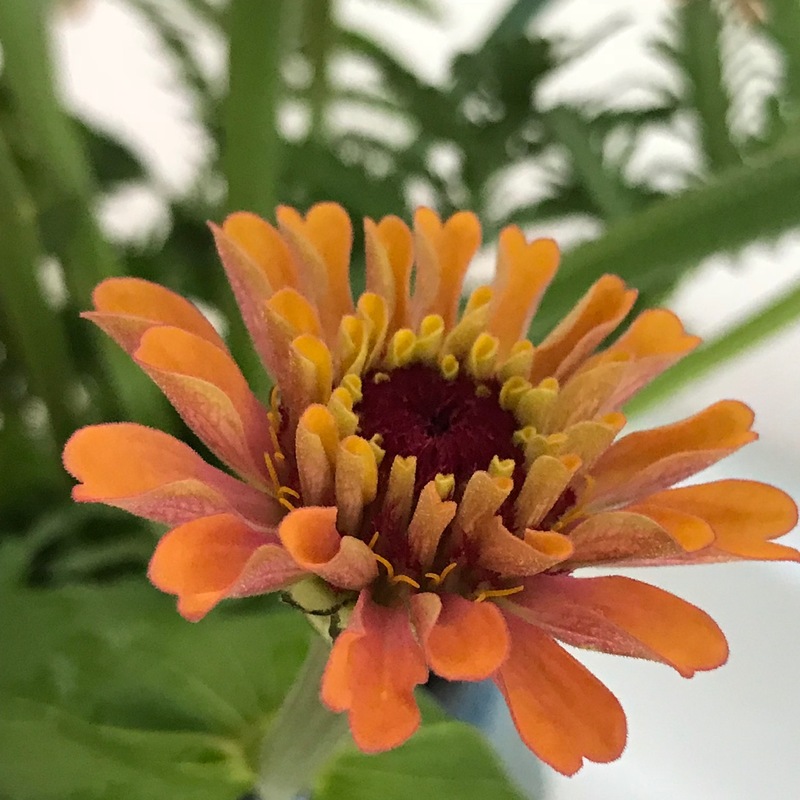 This entry was posted in garden and tagged 2018vase, flower arranging, flower design, in a vase on monday, nature photography, pass-along plant, tansy, Zinnia 'Cut and Come Again' (Zinnia elegant pumila) on July 23, 2018 by pbmgarden. Thanks Judy. Nice how flowers can hold those good memories for us. Have a good week. Beautiful bouquet! The tansy leaves give it a really nice touch and make it look like it was arranged by a florist. Thanks Cindy, the tansy is at its best right now. Your vase is lovely but as someone who collects pottery and textiles, I definitely must applaud those additions to your display. Thanks Linda, I respect your appreciation of pottery and textiles, having seen so many fine examples on your site. Having connection to the artists makes these very special. I love the Zinnias when one colour is suffused with another. A very happy birthday Susie; I’m glad you were able to celebrate with family. Thanks Christina–those birthdays just keep coming! I didn’t get my cactus zinnias this year, but these have turned out nice. Pretty zinnias and they are so perfectly neatly arranged! Happy birthday! Thanks Joanna. I count on zinnias to push on through until fall, but they’re at their best now. Happy Birthday! Your zinnias look great, mine had their best blooms early. Thanks. There’s nothing like that pristine freshness of the early blooms! Happy Birthday Susie – it sounds as if your family made a real occasion of it. Your zinnias are of course gorgeous, and what a lovely pair of mugs. I really like this sort of glaze. Well done for staring teaching the skills you have acquired – I am thrilled for you. Are you able to teach from home? Thanks Cathy, we had a great time. I’m teaching one Gentle Yoga class a week and subbing others at a Fitness and Wellness Center, where I began taking yoga about 14 years ago. I teach a few private classes at home also. I enjoyed reading your post, and a Happy birthday. I did not realise that planted at the start of June zinnia seeds could yield flowers so quickly. You nurtured them well. Thanks Noelle. 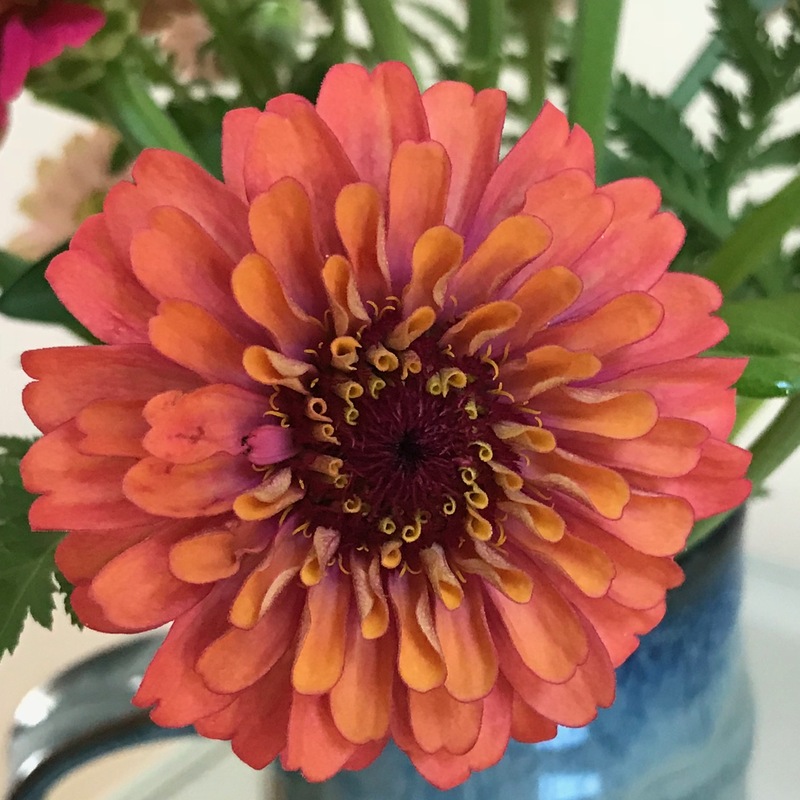 The zinnias are about the only thing I can grow from seeds–such a good flower. Both your garden and your family gave you delightful gifts for your special day. Happy birthday! I love zinnias but haven’t grown them in years but your sweet arrangement has me thinking that next year some should find a place in my garden. Peter, thanks for the good wishes. Zinnias are the only flowers I grow from seed, they’re so reliable. Happy birthday to you! What wonderful gifts that you will treasure for years. There is something old fashioned about zinnias, isn’t there? I have tried to identify what it is but can’t. Just the simple pleasure of a joyful, colourful flower that demands very little and gives so much? Thanks for the birthday wishes. 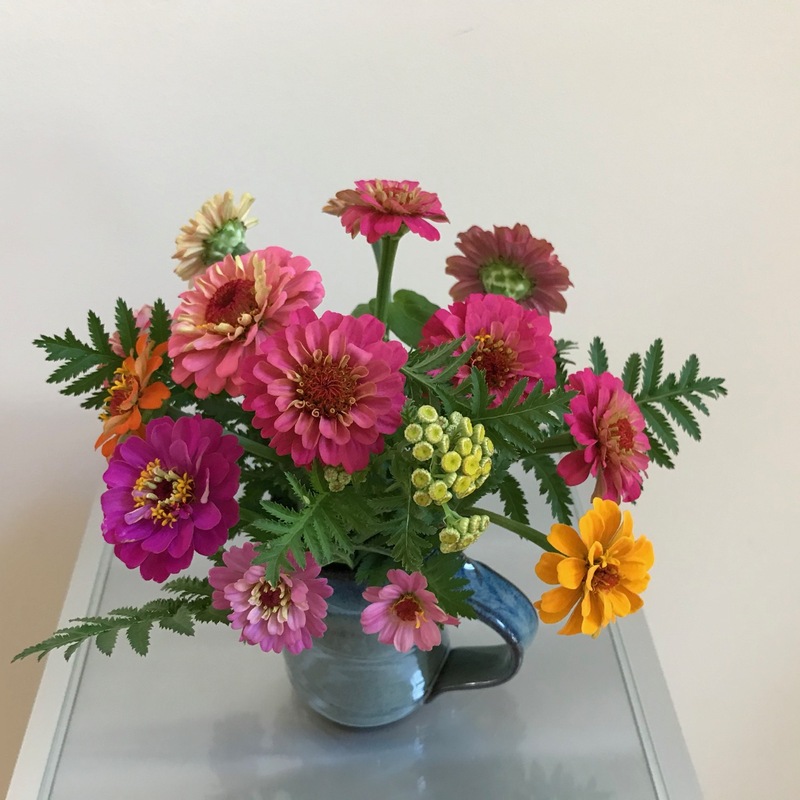 Zinnias and other flowers like those Cathy had in her vase today remind me of the kinds of flowers I saw growing up (sweet william, amaranthus, etc). Very nostalgic. Happy birthday, Susie! You did well with your birthday loot. 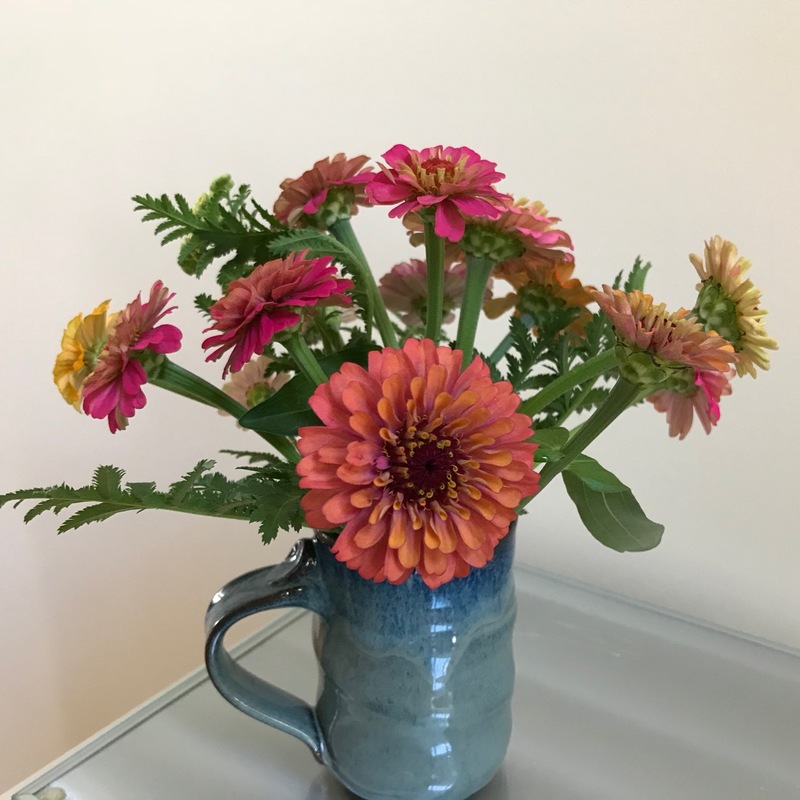 The zinnias in your new mug are perfect and nicely accented by the tansy and fresh green foliage. I love your sister’s table runner too. Thank you Kris, it was a good birthday–always more fun with lots of family around. Ah Lovely! I never got around to sowing Zinnia seeds this year, so I’ll just have to enjoy them on everyone else’s blogs. Sounds like you had a great birthday celebration. Too bad about your zinnias but you have lots of other delights. Alison I couldn’t leave a comment on your blog, but really enjoyed your dahlia, castor bean vase today. Happy birthday Susie. 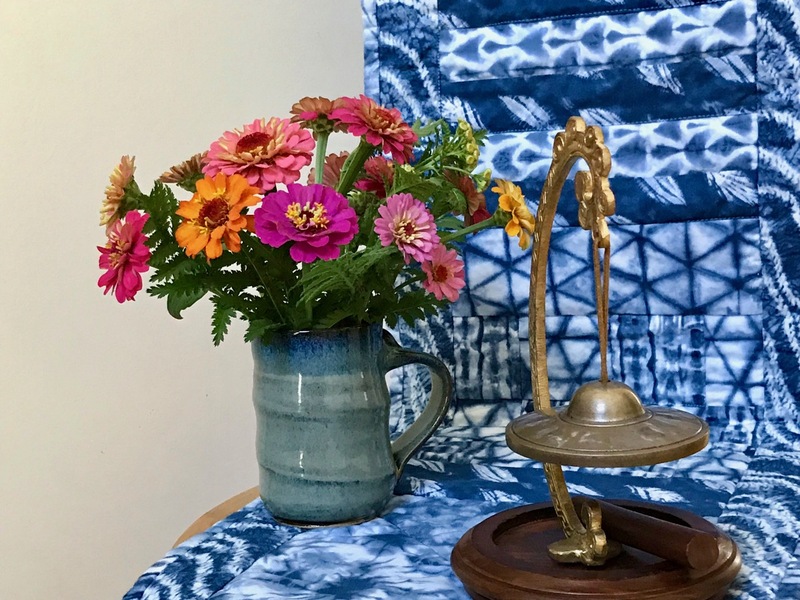 Zinnias are the perfect flower for a vase. This one is so pretty. I love zinnias and yours are particularly lovely, Susie. Again this year, slugs have done a number on mine, so its nice to see yours! Glad you enjoyed these zinnias and hope the slugs give yours a break so you can enjoy them. Zinnias are supposedly one of the easiest flowers to grow here, like nasturtiums, but mine always get mildew. Even if a few flowers look good, the stems are weak and the foliage is lacking. They look so much better from other gardens in other regions. Eventually these will get mildew also.